Well, that was the wettest September on record. 6.17″ of rain fell this month, breaking the old record of 5.71″. What’s amazing is that the 1.7″ we received on the 28th was more than the the average rainfall total for September. Not only that, but the total we received this September would be above average for December or January. No wonder we still haven’t seeded all our cover crops yet. The topic of what cover crops to plant is one that arises frequently around here. This year, we’ve settled on a mix of rye and vetch for fields we are going to be transplanting into and just vetch for fields we will be direct sowing into. Why? The reason we don’t plant rye into fields that will get direct sown crops is that rye is allelopathic, meaning that the decomposing rye inhibits other seeds from germinating. This is wonderful for suppressing weeds from germinating in a bed of spring transplants. But it’s terrible if we are trying to seed a crop of carrots. The other virtues of rye are that it grows very vigorously around here, even when planted as late as November; it outcompetes weeds, it provides tons of biomass, and it protects the soil from rain and flooding. There is one big downside to rye; it is hard to kill in the springtime… more on that later. For nitrogen fixation, we have settled on vetch as our primary cover crop. We like vetch more than clover because it puts on more growth in the fall and winter. Clover, on the other hand, puts on most of its biomass in the spring. We want strong fall and wintertime growth for weed suppression and to protect the soil from erosion and nutrient leaching. Being a legume, vetch also fixes nitrogen. The downside to vetch is that it can also be hard to kill. 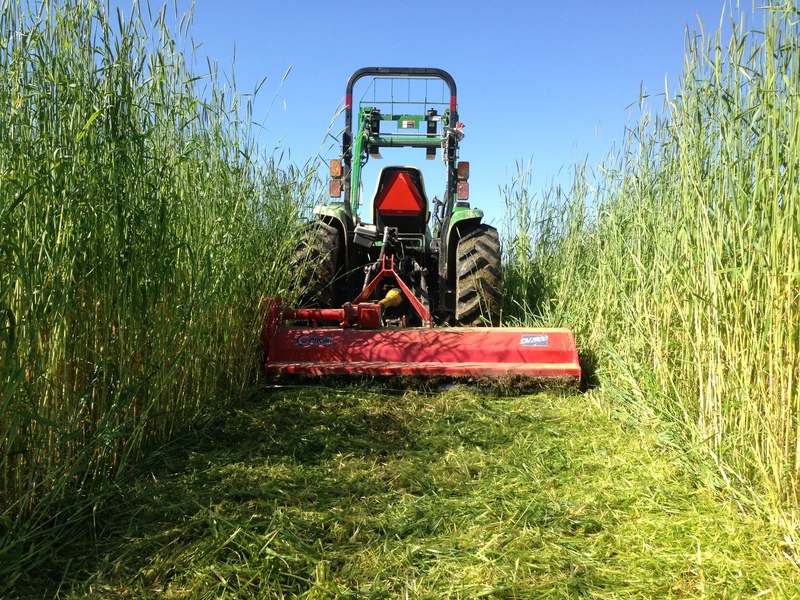 The flail mower has helped us better incorporate cover crops because it chops the plants into tiny pieces. So, about killing those cover crops…There is a movement among us ecological farmer types to minimize the amount of tillage we do. Generically, tillage means any type of soil disturbance for the purpose of preparing ground to plant crops into. The reason we want to disturb the soil less is that disturbing the soil, in any way, disrupts the complex ecosystem of bacteria, microbes, fungi, worms, and bugs. Without a healthy soil ecosystem, our soil would essentially be a inert medium (I have a feeling that commercial potato production is so destructive to the soil that the potatoes are basically hydroponic, but grown in soil). When our soil is happy and well fed, all micro-flora and fauna turns organic matter to fertile soil, enabling soil to both retain moisture and drain well and to hold nitrogen in a state usable by plants. For an interesting take on this topic, check out this article in the Atlantic. But when we speak of minimum tillage, reduced tillage, or no-till farming practices on a vegetable farm, the tillage tools we are primarily thinking about reducing are the plow and the rototiller. Why? The plow has been considered the enemy of soil health since its overuse in the 1920s & ’30s led to the Dustbowl. The plow does two things that are harmful to soil health. It inverts the soil, burying the top 6″ or 8″ where all the microbial activity is taking place, substantially harming the soil ecosystem. Plows also leave what’s known as a “plow-pan”, a hard layer of compacted soil created by the plowshare compressing the earth beneath it as it slides through the ground. The plow-pan, if it’s really bad, can block roots from penetrating deeper into the ground limiting the nutrients available to the plants and inhibiting drainage. 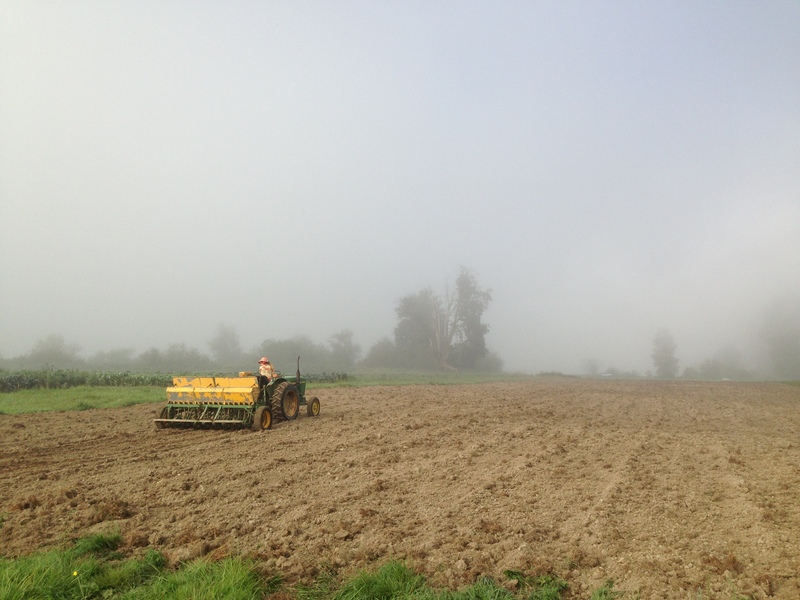 Neil, from Present Tense Farm, borrowed our tractor and plow to break new ground. You can see how the plow inverts the sod one strip at a time. The plow also has many virtues. As a tool for turning mature sod into workable soil, it has no peer. When done correctly, the plow inverts and buries grass (one of the world’s most tenacious plants) starving it of light and separating its roots from moisture. To achieve a similar effect with a tool such as a rototiller or disk, you’d have to work the soil over and over and over, pulverizing the soil but probably not really killing the grass. One pass with a plow followed by a light disking and you are ready to plant. Because the plow can do in one pass what other “less harmful” tools can do in three or more, I’ve been reconsidering the value of the plow in a sustainably minded system like ours… more on this later. The rototiller is bad for a completely different reason. Whereas the plow inverts, the tiller pulverizes. A rototiller is an amazingly powerful tool that works as effectively on small tractors as it does on big tractors, making it by far the most common tillage tool out there. Tillers are not “horsepower” tools like a plow or a disk that are dragged behind the tractor. Tillers are powered by the tractor’s “power take off” or PTO. 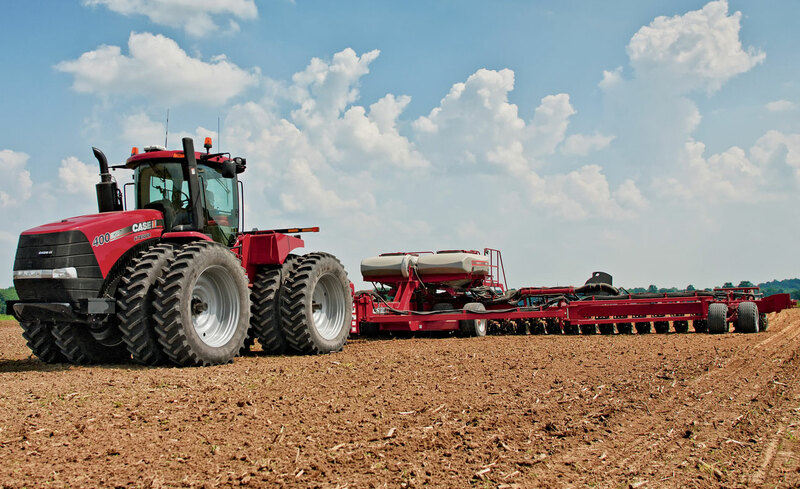 The PTO is a shaft on the back of the tractor that, when engaged by the driver, spins at 540 RPMs. The PTO transmission is geared very low, providing a lot of torque to the tools connected to it. Implements like tillers, mowers, and the like are hooked up to the PTO and can spin at blindingly fast speeds. The rototiller spins so fast that it breaks up the soil aggregate (the size of the soil crumb, held together by soil organisms) into a fine powder. This is wonderful for direct sewing small-seeded crops like carrots, lettuce, and mustards because you can calibrate depth very accurately. However, the smaller the soil aggregate, the more surface area. The more surface area, the more oxygen. The more oxygen, the more biological activity in the soil and the faster the organic matter gets eaten up by the microbes. Much like the dead zone in the Gulf of Mexico, introducing lots of oxygen into the soil causes the population of soil microbes to explode. They consume all the organic matter really quickly, and then die off for lack of food. This throws the soil ecosystem into imbalance. Soil overworked by a rototiller tends to be sandy and infertile. Sam rototilling beds last fall. The rototiller too does have its virtues. For one, they are relatively inexpensive, easy to find, and very durable. They also work really well, even on small tractors. This means that farmers just starting out can achieve pretty good results working soil without having to invest in big, expensive equipment. Though we strive to minimize the amount we use our tiller, it is truly the most used tool on our farm because it does a great job making a seed bed. (I do have ours set up to till as shallowly as possible, so that we are only working the top 2″-3″). What does this have to do with cover crops again? 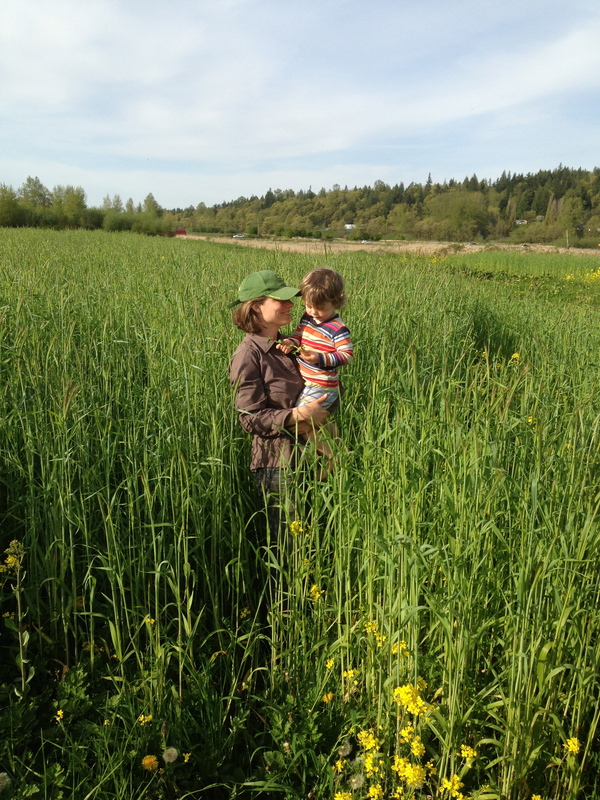 We want our cover crops to grow big so there’s lots of biomass to feed our soil microbes. But, as I mentioned earlier, both rye and vetch can be difficult to kill and incorporate into the soil especially when they are mature. It is doubly difficult to incorporate our cover crops because we are using relatively small equipment and are reluctant to use the most effective tools we have (the tiller and the plow) to do the job, fearing for the health of our soil. So, for a while now I’ve been coveting a bigger tractor, imagining that larger, heavier equipment (i.e. chisel plow or disk) would get the results we want. 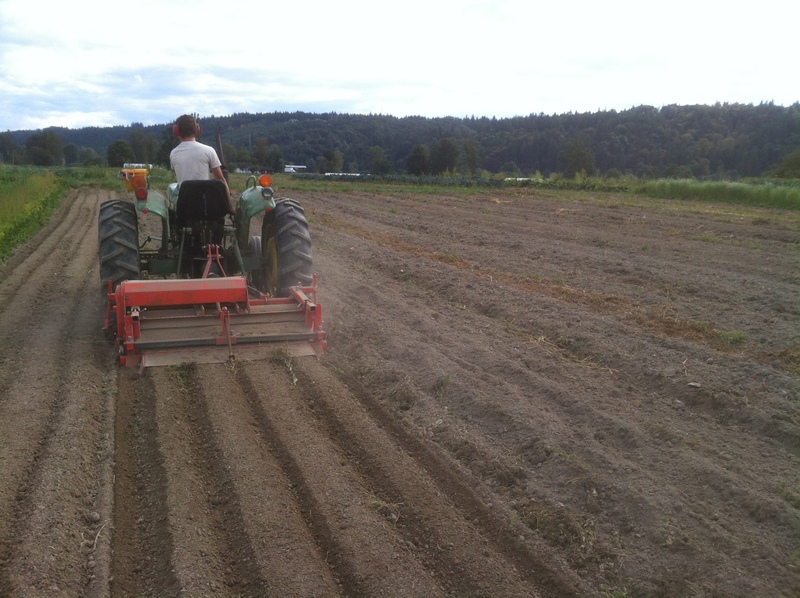 An encounter with an old-school farmer in the Skagit Valley has me reconsidering what “reduced-tillage” means on a small vegetable farm like ours. I tend to feel unsatisfied by our efforts to turn a field from cover crop to seed bed. In the spring, we mow, disk, spade, and till, only to leave lots of still-living cover crops (once the beds are made, those cover crops turn into weeds) in our field. When the soil dries out and the cover crops are bigger, we mow then disk and harrow repeatedly, but the biomass doesn’t incorporate well and clogs the equipment. Buying a flail mower has improved the process, but it still seems like we are driving over each field three or four times after we mow before it’s ready to be seeded or transplanted into. 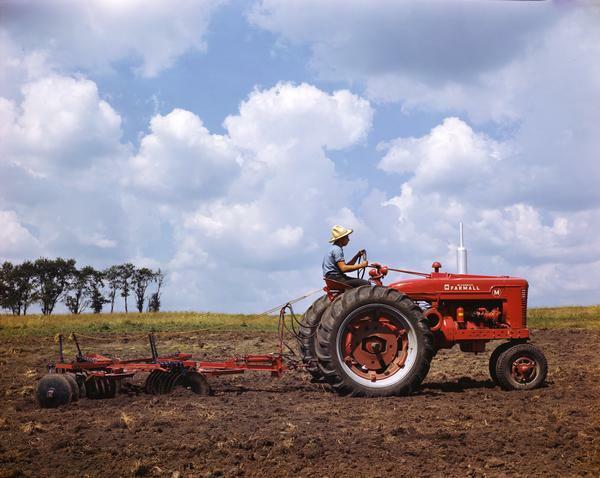 The old-school farmer I was chatting with reminded me of a few things… First, tractors much bigger than our 45 hp John Deere didn’t really exist until the 1950s. Rototillers didn’t become popular until the 1960s or 70s. Yet farmers were growing vegetables across the country on a much larger scale than we are, using small tractors and small equipment. Second, he believed compaction from driving heavy equipment over the ground repeatedly may do as much damage to the soil ecosystem as aggressive tillage. This Case IH 400 is one of the bigger tractors around these days…. it’s easily a whole order of magnitude larger and possibly two orders of magnitude heavier. Now, all our tractors are relatively light compared to the 300+ hp behemoths commonly used today for primary tillage on large acreage. Still, I hate driving over our fields so many times to work in cover crops, especially when each pass with the harrow or disk only feels 75% effective. And, one shallow pass with a 14″ two-bottom plow (at best (worst?) our tractor can only sink it about 8″ deep) is very effective at getting our cover crops incorporated and the field ready to have beds made. What I’m wondering is whether plowing a field shallowly, followed by a light disking is less harmful to the soil structure than repeated passes with a heavier disk or harrow. Very thoughtful Siri & Jason. I actually read it all; it’s the farmer’s daughter in me. Thanks so much for posting. I learned a lot from this. I am wondering how to go about working the soil when using only hand tools, which is how I have been gardening. But turning over soil is alot of work, and there is over 100m2 of garden… Sometimes I can get away with just weeding, but I normally use a cover crop (oats this year because I had free oats) and I want to incorporate the organic material. What are the effects of turning with a spade? Clearly not as pulverizing as a rototiller, but what would be the alternative? Last year I harvested the oat plant above the soil and left the root biomass. Then just weeded. Any suggestions? Turning your garden by hand, with a spade, a shovel, a broad fork is the best way to do it! Plus you get a nice work out. Congrats to bonnie on her marriage! Hi there, I think Eric Nordell from Pennsylvania likes shallow plowing to cut/kill the cover crop just below the surface. I think he calls it ‘skim plowing’, worth checking out. I’m with you on the challenge of figuring out how to work the soil/cover crop without tilling. Thanks for the blog post, interesting stuff! I’m going to look up skim plowing. It’s just what I’ve been thinking about… the difficulty being in keeping the plowshares just below the surface. 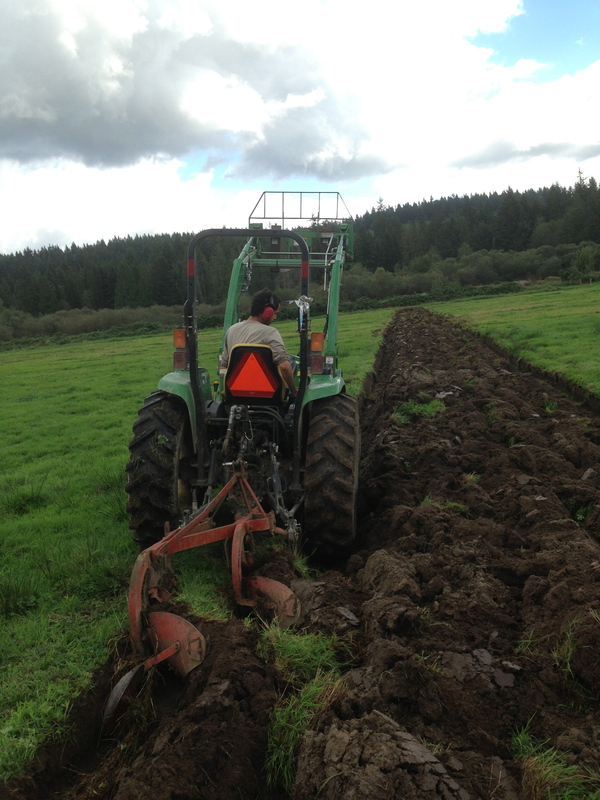 Perhaps it’s easier to do when you are farming with horses and riding on the plow….. I would also say to check out the Nordells. They have rad systems. In their booklet they show a walking plow but I believe he uses a riding plow now which I think could be duplicated with a tractor. Also, maybe you guys should give more time between your first tillage and planting? May give the rye a chance to break down and may also help with the allelopathic issues as well. Really enjoy your blog, thanks for keeping it real and sharing your thought processes with us! Thanks Ben, I did check out what the internet had to offer on the Nordells. Interestingly, a few years ago, I remember reading about their rotational/fallowing system and feeling it was too regimented for what we are doing. Over the years, we have increasingly moved toward that sort of system. As for the plow, in my experience, the issue with skim plowing is that it’s really hard to keep the plow at the right depth when your field isn’t totally flat. When I’ve used our plow, I’ve always tried to go as shallowly as possible, but when the tractor goes down even a small incline, it lifts the plow out of the ground. For this reason, I tended to bury the plow a bit deeper to avoid this happening. Probably too deep to be called skim plowing… I’d like to find/build a three or four bottom plow using really small 10″ or 12″ plowshares. I think that’d be a really useful tool for working in cover crops. We use an Imants spader and find it’s a good compromise between the plow, disc/roto-tiller combination. Related: I’ve studied the Nordell’s system and think it has merit, but no one seems able to replicate it on a production scale. The weed pressure is just too strong in the mid-Atlantic in organic systems. I haven’t personally seen it, but I think I recall reading about Natural Roots Farm in MA using the Nordell system (“bio extensive”) successfully. There are a few presentations by the Nordells on youtube, and maybe even their video “Weed the Soil Not the Crop.” The Small Farmer’s Journal publishes the Nordell articles every quarter and they are always a wealth of information, for horse farmer or not. Skim plowing requires very precise and technical adjustment capabilities. I’ve tried with the walking and sulky plows both and it is quite difficult. Haven’t been able to get it right yet, but maybe I just need a better plow. Or a better driver. I am interesting in getting a KV bottom, I like the way they work. The most efficient means of killing your cover crop is probably to run pigs over them. Crop quickly converted to usable nitrogen and all you need is a light harrowing to prepare for planting. Unfortunately, you need a lot of pigs for a short duration to do the job well–but perhaps in a more integrated local ag system this kind of thing could work. I remember some of the plows when I was a kid jason, that had a gauge wheel at the front which precluded the plow from going any deeper than set. Just lower the arms all the way to float position and the wheel compensates for lumpy terrain. A 14″ plow refers to the width of the cut, not the depth. From what I have read a plow is designed to dig down to a depth of about half of its width. My farmall cub with a 12″ plow leaves a furrow about 6″ deep. Your 14″ plow going 8″ deep is working right. Love your blog!